Using the following method, you will be able to rotate heightfields by an angle in the range (-90°, 90°). That is excluding -90° and 90°. Rotations by 90° and multiples should be performed in an external editor. The idea is as follows: We can not assign a certain point to a new position just like that, but we can calculate the theoretical position after rotation and try to move the point there. Unfortunately, you can’t really do this in TG2. Which is why we’ll take a different approach. 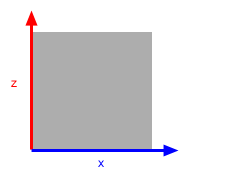 In the illustrations on the right the z and x axes are plotted as well as a grey square. Those drawings show what we want to do. 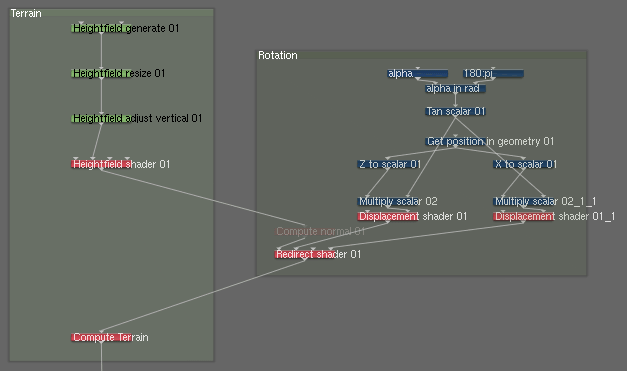 In addition, there is a screenshot of the node network below, showing the implementation of the rotation in detail. 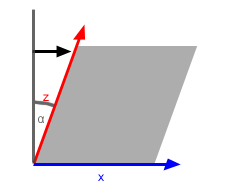 Step 1: The higher the z value of a point, the further it has to be moved along the x vector. To achieve this, we use Displacement (Lateral Only), which we restrict to the x vector using the Redirect shader. Thanks to Get Position in Geometry, the axis is being displaced, too. 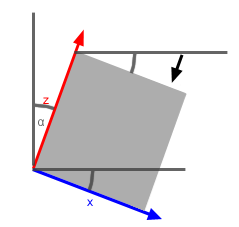 The alpha (α) angle is the angle by which we rotate the shader. The method to calculate the right factor for displacement from Alpha will be explained below. Step 2: The higher the x value, the more displacement along the negative z vector. 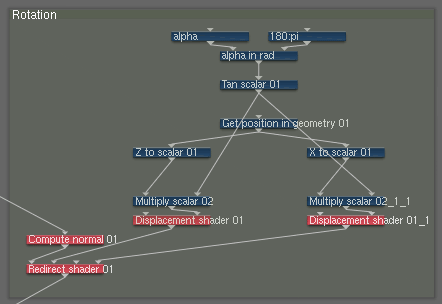 Instead of inverting the scalar, you can set the Multiplier in the Displacement Shader to -1, this saves a Shader and thus render time. Voilà: We rotated our Shader! All we have to do now is multiply the z and x values by the above calculated ratio, push them through a Displacement Shader and hook them up to a Redirect Shader. A single Redirect Shader is enough. The method described is working quite well. 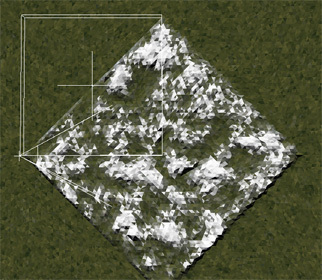 The following images show (from left to right): The terrain without any rotation, the terrain rotated by 0°, 45°, -45°. 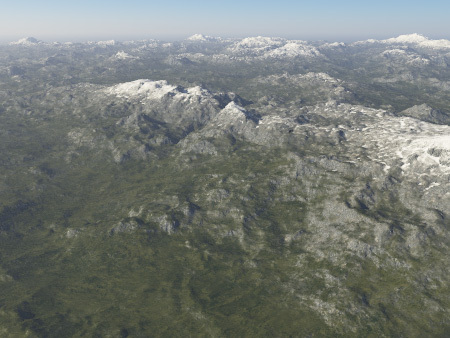 Camera, sun and terrain scale have been adjusted each time for comparability. There’s no visible difference between rotation by 0° and disabled rotation. The terrain doesn’t change using angles of ±45° either. Slight differences in the look of the surface are caused by the shaders used for Fractal Breakup, which were not rotated. It’s easy to see that the heightfield is much wider now. By the factor 1/cos(α) wider. You can use a Heightfield-Resize-Operator to scale the width and length of the heightfield down to original width · cos(α). You have to calculate this manually, Google’s built-in calculator will help you with that. Heightfield-Resize also resizes height – in order to undo this, we multiply the height by 1/cos(α) using Adjust Vertical or the Height-Multiplier in the Heightfield Shader. That procedure gets more important as the angles get larger. However, values of 70° or higher will cause heavy side effects like strong darkening of the terrain and other by-products of extreme displacement. Therefore, when trying to rotate by large angles you should rotate in 90° steps in an external program beforehand. The clip file can be downloaded here. The screen shot on the right shows how to integrate it with your network. That’s it! I hope I explained this method clearly. I just noticed that this only works for displacement, not for shaders in general. I corrected the article accordingly.